A rare street demonstration was organized in front of the prestigious Oguzkent Hotel in Ashgabat on June 8, the independent Turkmen emigre website chrono-tm.org reported. About 50 people gathered to protest the razing of residential buildings in Ashgabat, and were quickly dispersed by police. The last time people in the capital had protested the government's destruction of homes to make way for new government palaces was back in the 1990s. In the provincial city of Dashoguz last November, merchants staged a sit-in to protest the bulldozing of the popular Bay Bazaar, where many local people made a living selling fruits and vegetables. In February, citing a failure to gain proper permits, authorities decreed the demolition of some Soviet-era two-story apartment buildings. They were supposed to find new homes for people displaced, but some were forgotten and began appealing to the Turkmen Initiative for Human Rights for help. 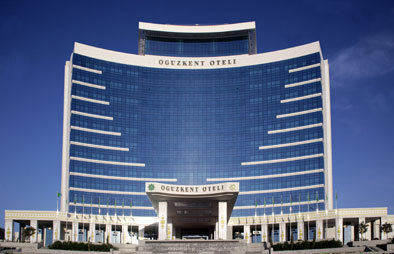 The protesters likely chose the five-star €270 million Oguzkent Hotel, built by the French construction firm Bouygues, because it is known to be the Ashgabat residence of President Gurbanguly Berdymukhamedov, and symbolizes the pompous building projects he has decreed since coming to power in 2007. On June 10 at a government meeting, officials announced that a new Housing Code would be drafted. Some observers thought this could be a reaction to the June 8 protest. According to several sources contacted by chrono-tm.org, residents of buildings in the Vodokanal district on the outskirts of Ashgabat were angered that they would lose their homes to make way for a new highway. The new code is supposed to allow people to privatize their homes, but there is concern that this will provide little protection against government reconstruction plans. One Ashgabat resident who witnessed the demonstration but requested anonymity said that the master plan for Ashgabat's reconstruction had never been published, and the public did not know what was coming. "I understand foreign construction companies, it's profitable for them to build within the city limits," said another man who only gave his first name, Vekil. "But the president must defend the interests of the citizens of the country, and not foreign companies!" Many people have found it risky to try building their own homes, because they can be accused of not obtaining the proper permit, or can find themselves in the way of the government's eminent domain at any time -- and without just compensation.